Builder Patrick Biggs (DViddy) says this was is meant to be a representation of a fellow fan, but whatever it is, it’s pretty awesome. 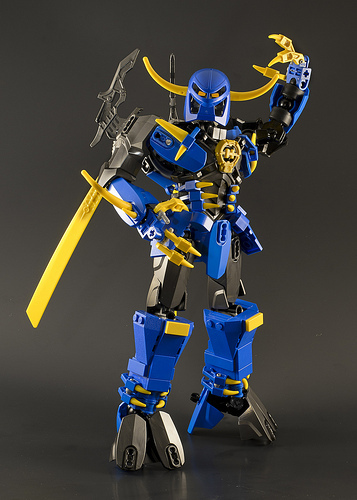 The blue and yellow make a snappy color scheme, and I love the integration of System and Bionicle elements in a nearly seamless fashion. Nice! I’m a big fan of the cloven-hoof feet and the System on the legs. Dayum! That is one snazzy looking fellow! The main reason I’m commenting, though, is the photography. It is so sharp, I thought it was a digital render at first. Well done! I love the integration of System and Bionicle elements in a nearly seamless fashion. That’s because they are actually hero factory pieces, which tend to be smooth as opposed to the ugly detailed Bionicle ones.